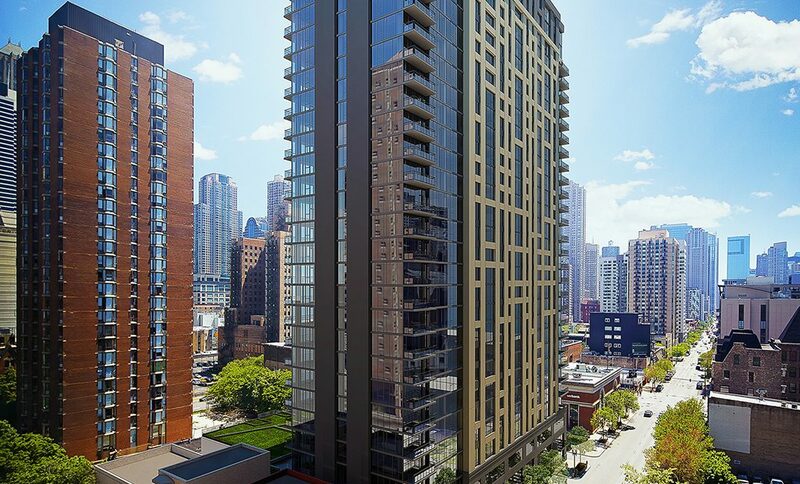 The luxury Gold Coast apartment tower being co-developed by Ryan Companies US, Inc. and Lincoln Property Company at 833 North Clark Street in Chicago has reached two noteworthy milestones. Simultaneous to the ceremonial “topping out” phase of the 31-story, under-construction structure, Aurélien was unveiled as the name and brand identity of the multi-family high-rise community. Aurélien is a $100-million-plus, 368-unit luxury apartment tower currently under construction at the southeast corner of Clark and Chestnut streets on a 41,000-square-foot land site. Construction on the project began last July and is slated to be completed by early 2017. Daiwa House Texas Inc. is the primary equity investor in Aurélien. To celebrate the topping out, a 1,200-pound, 9’-0” linear foot steel beam was lifted from the ground to the top of the building’s shell some 340 feet above. Development, design and construction team members and trades workers gathered on site for a private event to sign the beam and observe it being hoisted to the top of the building. Logos of those closely linked to the project were displayed on the beam. Herbst noted some interesting statistics about the construction of Aurélien. At this point in the construction cycle, 132 tons of steel beams have been used to shape the shell of the building. Additionally, 1,355 tons of rebar has been used, 20,150 cubic yards (2,239 truckloads) of concrete has been poured above grade, more than 500 panels of precast concrete have been installed and 411,000 pounds (or about 150 miles) of post tensioning cables have been utilized thus far during construction. Herbst also acknowledged that approximately 50 different subcontractor companies, and counting, have been instrumental in building Aurélien. The number of construction workers has averaged about 70 per day, swelling to 130 during the concrete pours. In total more than 155,400 safe hours have been logged to date. The name Aurélien makes an appropriate yet subtle reference to the development’s prominent location within Chicago’s renowned and highly sought-after Gold Coast neighborhood. Further, the European-based name portrays an image that is both classic and contemporary, reflecting the target audience of future residents that includes technology-driven, educated, young professionals or urban couples who desire a luxury living experience in the upscale neighborhood. When it opens in early 2017, Aurélien will comprise 368 luxury apartments, including 78 studios and convertibles, 209 one-bedroom units, 75 two-bedroom units and 6 penthouse apartments. Unit sizes, except for the penthouses, will range from 563 square feet to 1,252 square feet. Penthouse units will range from 1,179 square feet to 3,250 square feet. Aurélien’s location is ideal for residents living, working and playing in or near the Gold Coast. The site is situated in close proximity to transportation including two CTA stations and other public transportation options important to those who work downtown. It offers easy access to Lake Shore Drive and the Kennedy Expressway for those traveling by car to suburban destinations. The building is within walking distance of Chicago’s Magnificent Mile (North Michigan Avenue), the downtown CBD, the Northwestern and Loyola University graduate school campuses, and the Northwestern medical center. Located nearby are an abundance of restaurants, clubs, retail amenities, and cultural facilities. It is also within close proximity to the lakefront, from Oak Street Beach to Navy Pier. For leasing information for Aurélien, visit the property’s website at www.AurelienChicago.com.